I was pleased to be recently invited onto the editorial board of GeoJournal by new editor Dan Sui. Hi again, a short interview I did a few weeks back has been published on the Futurelab website. Many thanks to journalist Kim Thomas for showing interest in my research. Hello, I have just participated in an interesting two-day workshop on Designing for Forgetting and Exclusion at UCLA funded by NSF. Many thanks to the organisers, Michael Curry, Leah Lievrouw and Jean-François Blanchette, for asking me to participate. I spoke around my position paper, 'Do we need an ethics of forgetting in a world of digital "memories for life"'. I hope this project develops further. 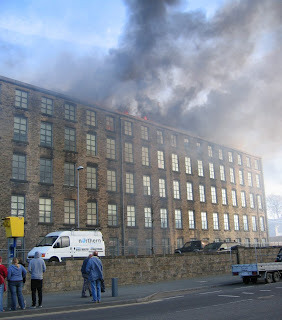 A dramatic day as a large part of the Wrens Nest mill in the town is gutted by fire. 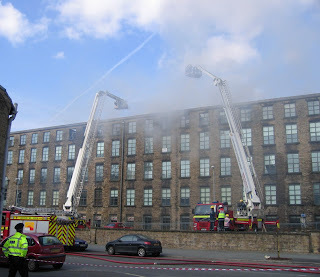 My friends were renting a top floor apartment in the mill and it is now completely destroyed. I am trying to develop some new ideas around pervasive computing and code/space related to the changing nature of material objects, particularly drawing on Julian Bleecker's notion of 'blogjects'. Rob gave a talk on this a few weeks back for a Geography seminar at the University of Manchester titled 'When things become other things'. The ideas are still pretty rough and need developing. We are giving this paper also at the AAG Conference in a couple of weeks in sessions we've organised on Software and Space. Had an enjoyable fieldtrip in Munich last week. 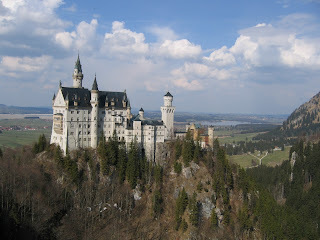 Highlights of the trip were a factory tour around the BMW plant (sadly no photography allowed) and a visit to the famous castle Neuschwanstein. 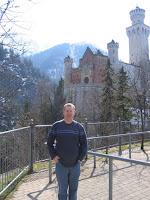 The castle's location was lovely and the views of the Alps were great.